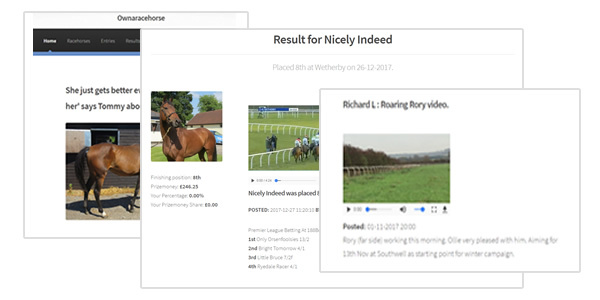 You can become a racehorse owner for a season for less than £99 with Ownaracehorse! We offer genuine ownership experiences with our racehorses and outstrip other syndicates when it comes to the value we offer. Whether its reporting or providing yard visits and owners badges at the races, we've been leading the way in online-syndicates for 15 years. We post a 'Big Race' preview for our shareholders most Saturdays. It's a full analysis of the biggest and most competitive handicap of the day - and usually the biggest betting heat. It's a free extra service we provide to our shareholders, written by our own racing professionals. For the Cheltenham Festival we're making these 'Big Race' postings public. We are under way, and its on to Day Two of the festival. This sees the RSA Chase and the Queen Mother Chase head the days entertainment, but there's also plenty of hurdling action as well. Our Festival Big Race Preview starts today and goes right through the week. The big race of the day is posted the evening before racing. Another tough Handicap to whet the appetite, and we hope Nicky Henderson can add to his Champion Hurdle success by saddling William Henry to victory in this 2m5f contest. For Day Two of the Festival we’ve chosen to put the 2m Coral Cup under the microscope to see if we can whittle down the choices in this big field of 26 runners. The race has been run on 24 occasions and often seems to be a battle between the Home Team and the Irish, with the score 15-9 in favour of the former so far. The statistics tell us that supporting the SP favourite needs caution, as not one has won since 2003, although 11 of the last 12 winners did come from the top 7 in the betting and the open nature of the race means that the S/P can still be in double figures. Willie Mullins remains win-less in this race, he got nowhere with 5 runners last year and has the same number running this year. One of them is the current favourite, 8yo Max Dynamite, who has actually won only one hurdle race - and that was in Thurles back in 2014. However that isn’t the full picture as he has run with distinction in some very high class Flat races around the world, as well as good efforts in big hurdle races. Also he’s the chosen mount of ace jockey Ruby Walsh. He may well be the one to do favourite backers, the Irish, and Willie a big favour (if indeed he does go off as favourite). Age doesn’t seem to matter in this race, except that the last 10yo to win was in 1995 and they have been rarely even placed since then. The top weight, Gordon Elliot’s Diamond King, is a 10yo who won this race in 2016 but no horse has ever won this twice, so we are leaving him out of our calculations on both counts. The winner tends to come from the top portion of the handicap, 7 of the last 9 were top 8 horses in the weights. Only four of the last 17 winners had previously run at the Festival (There are 6 in the field, so we have used this fact to help narrow down our choices). Also in recent years, all of the winners had not run for at least a month and preferably had a short break. We particularly like the look of WILLIAM HENRY, one of Nicky Henderson’s four runners. He’s lightly raced (9 runs altogether), been around Cheltenham (not at the Festival) 4 times although one was in a chase. He was a good winner of the Lanzarote Hurdle in January and will come here fresh. He beat Paul Nicholl’s Top of the Game in that race but they remain closely-matched at the weights so it wouldn’t be a surprise if the result were reversed. Half of the winners in the last 16 years have been French-bred, and among this year’s runners we hope that Gordon Elliott’s other runner, the 7yo mare Barra could be place value based on her latest run when finishing in 2nd place at Leopardstown last time out in January. She has ran at the Festival, when runner up in the Mares Novice Hurdle last year, perhaps this run won’t count against her in the stats on this occasion. So we are going for WILLIAM HENRY as a likely winner and suggest Barra as the each-way value in the race. This is not an easy race for anyone to call, especially with 26 runners and heavy going and we wish you good luck with whatever you choose. Enjoyed this Big Race preview? We post a 'Big Race' analysis on Saturdays for all our shareholders, posted to our Racehorse Manager. Considering getting involved in racehorse ownership this summer? We have summer jumpers and plenty of flat horses still available, some of which will be racing pretty soon.